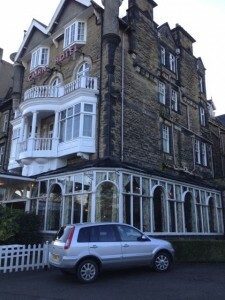 It is the agreeable and, I think, unique custom of the Harrogate Decorative and Fine Arts Group to invite visiting lecturers to contribute to their scrap-book. On Monday 20 January I lectured to them on the Bayeux Tapestry, in the elegant setting of the Cairn Hotel. I expected the ballroom to be cleared at any moment in readiness for the next thé dansant. My talk was not short of references to North Yorkshire, which, apart from anything else, was the scene of Harold Godwinson’s triumph in 1066 over the Viking army at Stamford Bridge. Here, then, is a summary of such references as my offering to the society. The Bayeux Tapestry, completed within a decade of the Battle of Hastings, is wonderfully revealing of the life of the time. Harold Godwinson and other nobles are, for example, inseparable from their hawks, a detail that written histories tend to omit. Moreover, the artist is strictly accurate in his depiction of the hairstyles of the day. The smart, military haircuts of the French knights are contrasted with the shoulder-length hair and wispy moustaches of the English. A Norman with facial hair stood out from the crowd. One such was William de Perci, the founder of Whitby Abbey, who was known (in the Norman dialect) as als gernons – ‘with the whiskers’. Since the fifteenth century, generations of William’s descendants, who became earls and then dukes of Northumberland, have been christened ‘Algernon’ in his honour. Undoubtedly the most famous ‘Algernon’ was the Victorian poet Algernon Charles Swinburne, whose grandmother was a Percy. 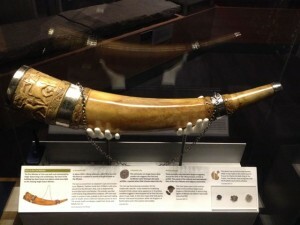 In a scene of Harold feasting in his manor-house at Bosham, Sussex, his retainers use traditional drinking horns. These were prized possessions of the English nobles, often chased with gold and silver and jewels. Usually of ox-horn, they had a design fault: one was obliged to drain them before putting them down. The cup-bearer was constantly in attendance, napkin in hand, to recharge them, and there were endless pledges and toasts. As a result, the English nobles became rapidly inebriated. They were renowned for it. Incidentally, they would not have been drinking ale or even wine, which was somewhat of a luxury, but mead, which is made from honey. Domesday Book is evidence of immense honey production in England, fuelling the demand for this drink. 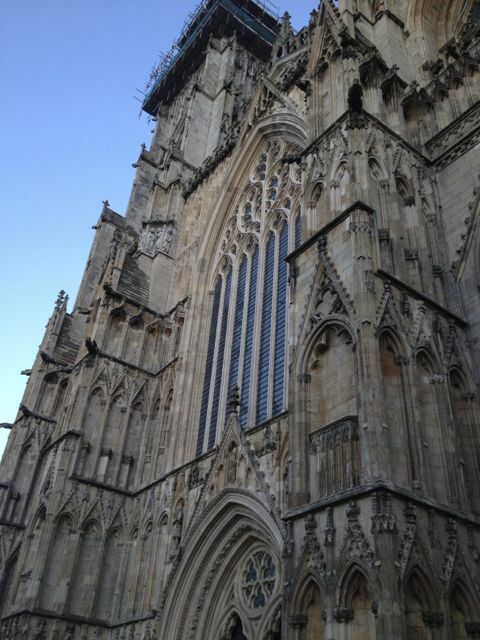 York Minster happens to possess the only horned cup that, to my knowledge, survives from that period. It is known as the Horn of Ulphus. The eponymous Ulf was a Viking who, about 1030, made a gift of it to the Minster, along with a grant of land. He is said to have poured a libation of wine over the altar as a way of marking his donation. 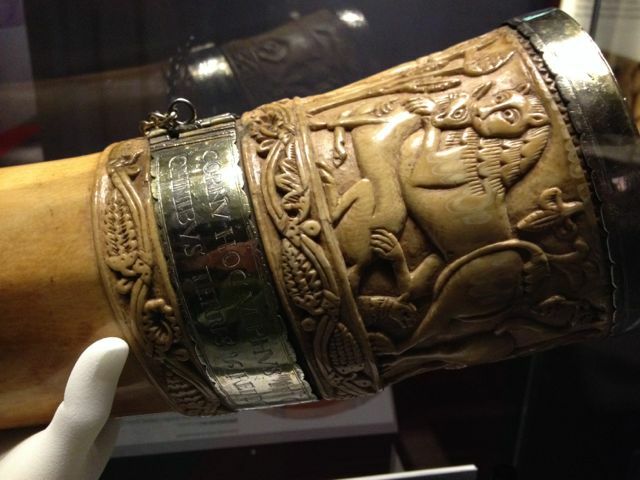 A particularly fine example of such a cup, the Horn of Ulphus is not, in fact, an ox-horn but an oliphant - carved from an elephant’s tusk. It is thought to have been a product of Amalfi in southern Italy, where there were ready supplies of ivory. The animal motifs are, moreover, copied from Syrian and Babylonian designs. An early Frith postcard shows it hanging from a hook on the panelled wall of the Vestry, where it was no doubt kept for centuries. It is now displayed, more reverentially, but less in the original spirit of the gift, in a glass case in the Treasury. 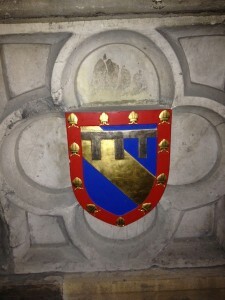 Finally, North Yorkshire is the heartland of the Scropes, one of the most prominent British families of Norman descent. Unusually, they were already settled in England at the time of the Conquest, their ancestor, Richard FitzScrob, being one of Edward the Confessor’s Norman favourites. They had no doubt met during Edward’s twenty-five years in exile in Normandy, while Cnut and his son held sway in England. Richard seems to have built Richard’s Castle in Herefordshire, one of a number of pre-Conquest outposts against the Welsh. Presumably of the ring-work (ditch and palisade) type, these were the earliest true castles in England. They are an innovation otherwise associated with the Norman Conquest. The Scrope family motto, Devant si je puis (‘Forward if I am able’), is a sardonic allusion to their name. Scrob means ‘crab’ in the Norman dialect. Establishing themselves in Wensleydale in the 12th century, Scropes distinguished themselves on the Crusades and in the Hundred Years War, were regularly summoned to medieval parliaments as barons, and have produced five Garter knights, as well as an Archbishop of York in the person of Richard Scrope. My obituary of a recent head of the family, Simon Scrope (1934 – 2010), can be read on The Daily Telegraph website – http://www.telegraph.co.uk/news/obituaries/7607958/Simon-Scrope.html.